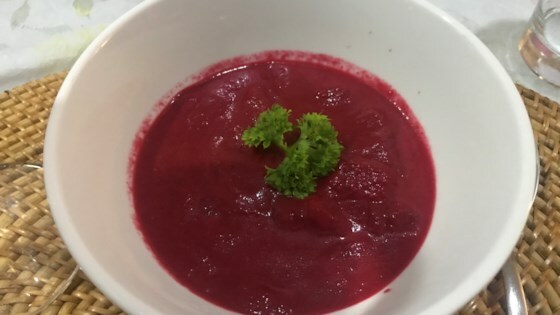 "A gorgeous, healthy, and very tasty beet soup that's so simple to make. Beets and sauteed onions and garlic simmer in beef broth before being finished with a swirl of cream." Delicious! One of the best soup recipes I've ever made. I made the recipe with chicken broth instead of beef stock, and it made the soup a bit lighter. We had some beets in our produce co-op that we didn't know what to do with. This recipe was great! We didn't have enough beets so we added some potatoes too. Easy and yummy! I just discovered a new love for beets! I sliced the beets thin, which allowed the cooking time to stay closer to the approximated 20-25 minutes. Great option for beets in a healthy dish. But make sure your beets are fully cooked otherwise you will get a grainy/lumpy cream. This was easy but not exactly quick - the beets took longer than I'd expected. Oh and I don't have a blender so I couldn't puree the soup, but it was still pretty good.